While road tripping through Jordan in 2012, I made a stop along the Kings’ Highway in Madaba. 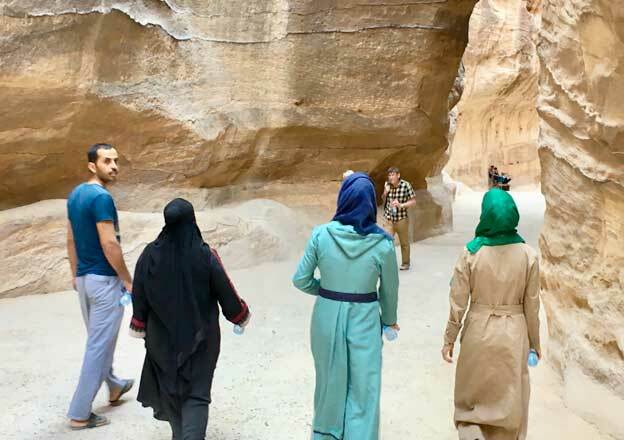 Art is one of the means of gaining insight into a region’s cultures, and this town holds a lot of artwork in the form of mosaics. 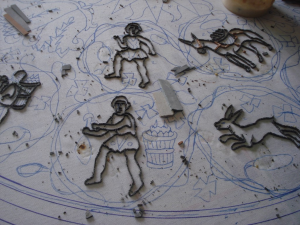 In addition to looking at ancient, unearthed mosaics here, you can watch artists making mosaics in Madaba. Much of the Middle East is covered in mosaics of the past, and I’m intrigued by the intricacy of their ancient depictions. 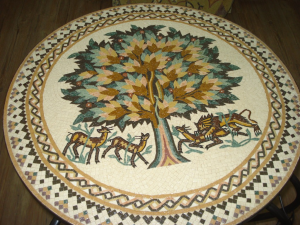 But when I arrived in Madaba and found that Jordanians are creating new mosaics in the present day, this intrigued me even more. On my upcoming trip through the Middle East this autumn, I plan to stop in Madaba for a few days. In part because I want to learn more about its mosaics and their creation, and also because the town is home to one of the largest Christian populations in the Middle East. Madaba’s most famous mosaic is about Christianity. 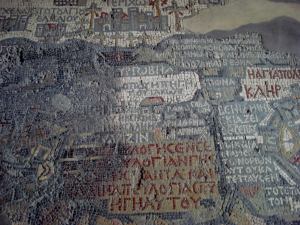 The Mosaic Map, a famous 6th Century portrayal of the Holy Land, is filled with names and dates of events telling the story of the history Christianity in the Middle East. The mosaic map originally consisted of over 2 million pieces and measured 94 square meters. Fire, water and other ravages of time destroyed approximately 75 percent of it, but what remains is still quite large and covers the floor of the Greek Orthodox church of St. George. 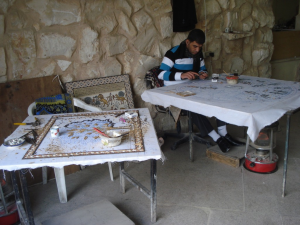 The Jordanians who are today are making mosaics in Madaba use great skill and care. 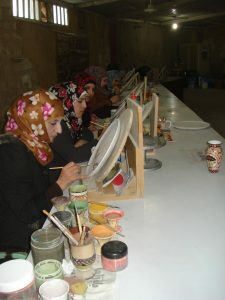 They create their intricate pictures by breaking colored stone or ceramic into tiny, flat pieces. Artists draw a design on a hard, flat surface. Next they glue the tiny pieces onto the hard surface and let them dry. 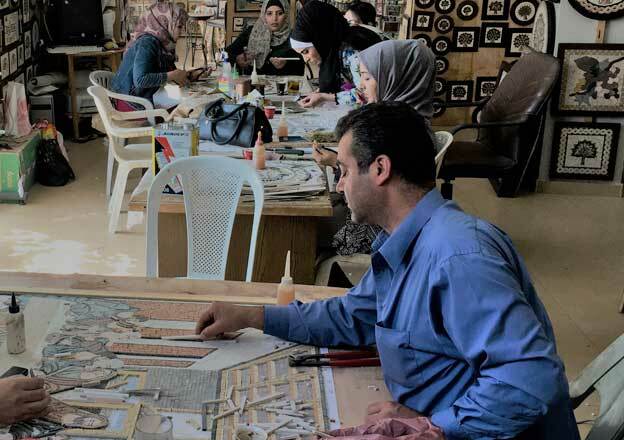 When making mosaics in Madaba at the art center I visited, rather than attaching individual bits of rock and ceramic directly onto the hard surface on which they will remain, the artists take an extra step of first gluing them upside down onto a piece of cloth. Once dry, they then flip over the arrangement and glue it as a single piece onto its final surface, where this new mosaic will look beautiful forever, like the mosaics of the past. 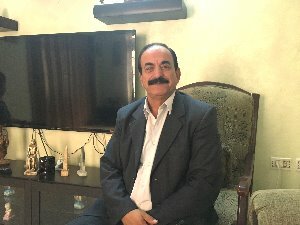 Piecing together the puzzles of the Middle East is a part of me and it’s a part of Madaba, so this little town is going to fit well into my upcoming journey.